This is what an online apocalypse looks like: "Don't break anything! There's no one left to fix it!" Last Thursday night, members of The WELL, the 27-year-old San Francisco-based online community, were shocked to receive a mass email alerting them to the fact that the system's owner, the online magazine Salon.com, had laid off all the WELL's staff and was searching for a buyer. The WELL has been for sale before; the more alarming news was the staff lay-offs and the news that the domain name – well.com – might be sold separately. Cue panic and a good old-fashioned WELL thrash about what to do. Some, afraid that a sale might mean their years of postings would be turned out into the open internet, advocated mass deletion. This was the spark for the "Don't break it!" panic: too much deletion too fast could make the system unstable. Others, more hopeful, suggested alternate platforms. No one involved will say much, but there is talk – and hope – of a member buyout, at least of the community and its archives. The domain name is another story; in a posting on Google+, the experienced CNN journalist and long-time WELL member Declan McCullagh suggests that well.com could be worth $5m. That's a lot of money to Salon, which is losing a million dollars a year. 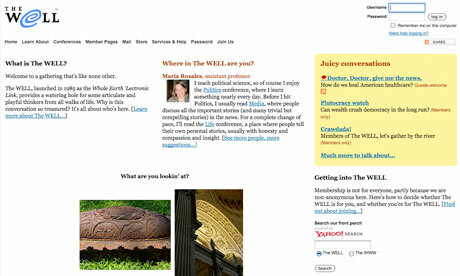 In today's world, populated with millions of free comment boards and web forums, the WELL is a weird throwback. Imagine: its members pay subscription fees. And again: the WELL is pure text, uninterrupted by icons, pictures, graphics, Flash animations, video clips – or advertising. Its technology was designed to foster thoughtful conversation. And, more than most sites today, it has a sense of place. Partly, this is due to the fact that most of its members are based in and around San Francisco, and meet in person frequently. But longevity also helps: to help out fellow members, WELL folks have organised a medical airlift, helped decipher years of a child's leukaemia treatments, and mourned together over deaths. It is not easy to imagine replicating all that. "The WELL has long since been something larger than the sum of everybody's friends," Howard Rheingold wrote in his 1992 book The Virtual Community. The way this community coalesced has been widely studied and has influenced a generation of online community designers. Yet the WELL was always small; at its peak the membership was perhaps 14,000. Now, Salon's annual filing puts it at 2,693, bringing in $380,000 a year – enough to pay for itself on today's cheap hardware, but negligible by Facebook standards. That it punched above its weight had a lot to do with the people it attracted. Founded in 1985 by Michigan-based computer conferencing pioneer Larry Brilliant and Stewart Brand, the editor of the Whole Earth Catalogue, the WELL has numbered among its members the founders of Craigslist, Wired, the Electronic Frontier Foundation, the influential Computers, Freedom and Privacy (CFP) conference, and Salon.com itself, as well as writers from the New York Times, the New Yorker, the San Francisco Chronicle, the San Jose Mercury News, CNN, and Time. In 1994, when Kevin Mitnick, the most famous computer hacker of the day and now the author of respected books on computer security, was on the run from law enforcement, it was files he parked on the WELL that helped track down his location. Over a few years in the mid-90s, while AOL (founded the same year) reached millions of users the WELL's original owners – Larry Brilliant's Michigan-based computer company and the non-profit Point Foundation – both sold out their half-shares to Bruce Katz, the founder of Rockport shoes. In 1999, it was acquired by Salon.com, one of the earliest "new media" startups aimed at doing serious journalism on the web. At the time, everyone was happy about this: Salon was more or less founded on the WELL, and many of its top editors were daily presences. But Salon's finances have long been precarious, and now they're dire. In the past two months, the CEO and CTO have left, both replaced by Cindy Jeffers, who for the last couple of years has been the CTO of the Huffington Post. Meanwhile, Salon's most recent annual report, filed on 29 June, showed that cumulatively the company has lost $112.5m. Its revenues are barely half its approximately $2m a year in expenses. These revenues themselves – from both advertising and subscriptions to its advertising-free services – are dropping. But the sentence in the report's discussion of the WELL that really scared WELL members was this: "…current subscriptions will be honoured but not renewed upon expiration". People who pay by the month read that on Friday 29 June, and had to ask: would they be cut off on Monday? Today, it seems clear that Salon is not switching off the lights as quickly as that. Almost immediately, two very different sets of concerns emerged. First, what would happen to the community? Could it reassemble somewhere else? Or could its users, collectively, buy it themselves? This part of the conversation is being had on the WELL itself, and in existing WELL groups on Facebook and LinkedIn as well as new outposts on Reddit and elsewhere. It is the kind of conversation communities have had since time immemorial when their favourite pub, community centre, village hall, church, or cave is scheduled for demolition. The second, however, is less easily solved: it is about individual members' online identities, which are tightly linked to the well.com email addresses many have had for more than 20 years, and the personal websites hosted at well.com, with links pointing to them from all over the web. Yesterday, the science fiction writer Bruce Sterling begged for someone to buy it so he could keep his email address. We read a lot about how email isn't so important any more because most of us have many different ways to connect with the people in our lives – mobile phones, instant messaging, social media sites. What many fail to recognise is that their access to most of those things is mediated by their email address. Every site you belong to or use, from Facebook and Twitter, to the Guardian's comments section, to your accounts on banking, retail, and government sites is locked to your email address. If you do not own your own domain and manage your own email – which few people now bother to do – your entire online life is at risk if someone pulls the plug on your email address. Few internet businesses are even as old as the WELL, yet we expect them to be old and faithful, like the Royal Mail. If you're going to rely on the kindness of outside email providers, make sure you have backups. subscribers have come to expect over the years. Salon Media Group for working with us to make this transition a success." wish The WELL countless more under their new management." well known in the worlds of technology, music, and publishing. reciprocally, no one may use those words without specific permission.